Photoshopped version. This would be their wedding photo from 1904. Vera’s in a lovely dress. Original version courtesy of Mabel Tripp family. James Albert McKenney, son of George Washington McKenney Jr. and Belle Sparks, was born 1884 March 22 in Sedan, Chautauqua, Kansas and died 1971 May 30 in the same. 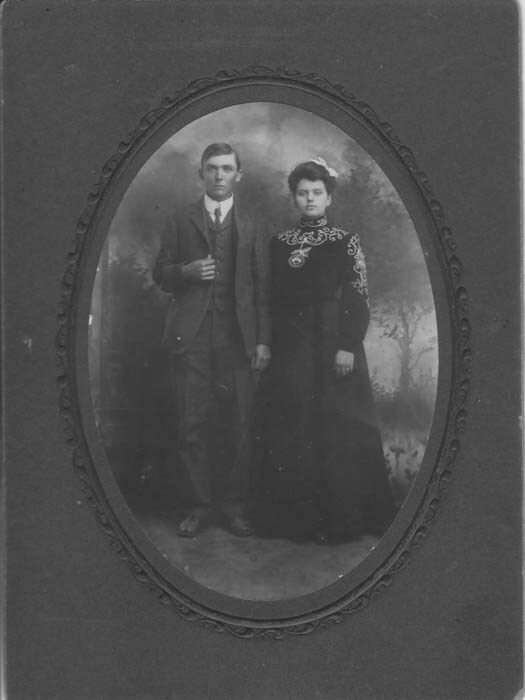 On 1904 Oct 23 he married (1) Vera Crockett, daughter of Samuel Kelly Crockett and Sarah “Sadie” Elizabeth Hackney. She was born 1886 March 1 and died 1933 March 6 in Chautauqua County, Kansas. 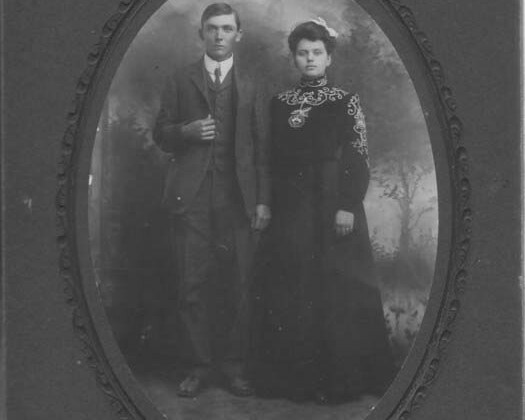 After Vera’s death, on 1935 Oct 26 James married Ada Brunger who was born 1891 July 21 in Chautauqua County, Kansas and died August of 1985. Continuing on. James Albert McKenney and Vera had 4 children. Mildred May was born 1907 May 15 at the old Crockett farmhouse in Belleville, Chautauqua, Kansas. She died 1907 May 18 and is buried at El Cado Cemetery in Chautauqua. Lloyd Clinton was born 1909 Jan 28, again at the old Crockett farmhouse. He would marry Dorothy Nadeen Noyes. DIRECT LINE. Thelma Allena was born at the new Crockett farmhouse on 1911 May 11, the old one having been destroyed by fire Oct 12 1909, killing Vera’s grandfather, James Kelly Crockett. Lela Muriel was born 1914 July 19 at the new Crockett farmhouse and died 1991 May 30 in , Bexar, Texas. On 1935 June 5, she married John R. Ziegler who was born 1913 July 27 in Texas and died 1988 Feb 12 at , Kerr, Texas. Other than the fact he had a farm and was part owner of a feed store in Sedan, I don’t know much about the life of James Albert McKenney. He spent his childhood between 1888 and 1897 on the Osage Reserve and in Kay County, Oklahoma. By the 1900 census his family is back in Chautauqua. In 1904 he married Vera there. State of Kansas, Chautauqua County, ss. In the Probate Court of said County and State. James A. McKinney, who now here makes application for marriage license, addressed to any person authorized by law to join in marriage the said James A. McKinney, aged 21 years and Vera Crockett, aged 18 years, being by me first duly sworn doth say, that they have the unqualified consent of their parents in their marriage, and that neither of said parties has been divorced by the decree of any Court in this State within six months last past. And that they, the said James A. McKinney and Vera Crockett are not related to each other in the degrees prohibited by law, to wit: Parent and child, grandparent and grandchild of any degree, broth and sister of either of the one-half or of the whole blood, uncle and niece aunt and nephew, nor first cousins; and that there exists no legal impediment to said marriage. In testimony whereof, I the undersigned, Judge of the Probate Court in and for Chautauqua County, and ex-official Clerk thereof, have hereunto subscribed my name and affixed the seal of said court, at my office this 22 day of October 1904. State of Kansas Chautauqua County ss. and of this License you will make due return to my office within thirty days. State of Kansas, Chautauqua County SS. I, W. Stucky do hereby certify, that in accordance with the authorization of the within license, I did on the 23rd day of October A.D. 1904, at Sedan, in said County, join and unite in Marriage the above named James A. McKenney and Vera Crockett. Witness my seal the day and year above written. Filed 23 day of October 1904. In the 1905 census, James Albert and Vera are living next to James’ parents. On the other side are the Godwin’s with Weltha McCormick in the household. Weltha was a daughter of Samuel and Mary Elizabeth Sparks McCormick, Mary Elizabeth being a sister of Belle Sparks, so Weltha was a first cousin of James. James and Vera were 23 and 21 at the time of Mildred May’s birth and dead in the spring of 1907. They were about 24 and 22 when Lloyd Clinton was born in 1909. Again, in 1910, James and Vera are living next to James’ parents. To either side are relatives of the Crocketts, the Stricklins and Jacks. Source Citation: Year: 1910; Census Place: Belleville, Chautauqua, Kansas; Roll: T624_433; Page: 23A; Enumeration District: 1; Image: 1229. In 1911 Thelma was born, then Lela in 1914. The 1915 census shows the family living in Chautauqua now beside Vera’s parents and Elouise Crockett Brockey and her husband, Nathaniel, Eloise an aunt of Vera’s. The 1920 census shows James and his wife sharing the household with Vera’s parents. In 1928 their son Lloyd Clinton married Dorothy Noyes. In 1930 James Albert is living in the household of Vera’s parents. Thelma, their daughter, is instead recorded in the 1930 census in Cowley Co. in the household of Buell Kelly Crockett, her uncle. Next door to the Crocketts and Thelma McKenney is Charles Fuller, a mixed-blood descendant of the Great Nemaha Reserve Loise/Baradas. That year (I believe) Charles will marry Cappie Trent, mixed blood Cherokee, her parents being Jefferson Trent and Sadie Bell McWhirt (who married second John Bigheart). Sadie was a daughter of James Marion McWhirt, brother of Samuel Alvin, and was a niece of Addie McKenney McWhirt. Jefferson Trent was a nephew of Felix Quinton who was married to Julia Martin, daughter of Alexander Martin. Franklin Tripp, who married Mable Clair McKenney, James Albert McKenney’s sister, was living in Cowley Co. Arkansas City in 1920. He was a son of James Tripp and Jennie McWhirt (a sister of Samuel Alvin), who married second Mary Elizabeth Sparks, sister of Belle Sparks McKenney. In 1931, James Albert’s sibling Carrie Isabel died. Then on March 6 1933 his wife, Vera, died after 28 years of marriage. She was only 47. On June 5 1935, James’ last child marries. A few months later, in the fall, James married Ada. Two short months later James’ mother, Belle, died at the age of 67. * Seven degrees of separation notes: a 1st cousin of Robert was Irvin Jay Sanborn who married Iantha May Copple in Chautauqua. Iantha’s mother was Elmira Belle Heavlin, granddaughter of a Samuel D. Heavlin from Harrison County, Ohio. Samuel’s brother appears to have been perhaps Stephen H. Heavlin who married Elizabeth McKinney in 1846 in Harrison. Elizabeth McKinney’s grandfather was a George McKinney Sr. b. 1760 in Ireland, died 1845 in same. No idea if he is related to our McKenneys. But it’s been considered a possibility. Another possible former connection with the McKenneys is Iantha’s grandfather, John, had a brother named William in whose house Benjamin Sparks (James Albert McKenney’s mother) was living in 1880. And there’s even another convoluted connection. 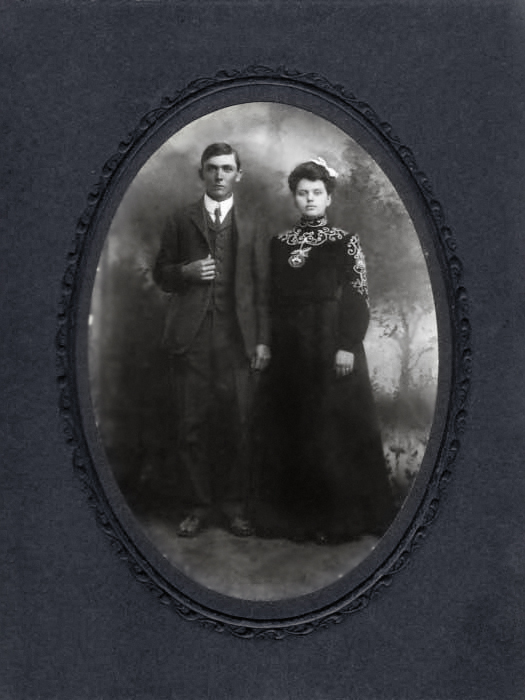 Rebecca Partelow (connected with the McKenneys and Hackneys beginning in Van Buren, Iowa) married a William Joshua Lovell in 1876. William’s mother was Catherine Murphy. Her brother Harvey married a Barbara Ann Logan, daughter of an Elizabeth Spoonamore. Their son, William Henry Murphy, married Margaret Copple, another daughter of William and Elmira Heavlin Copple’s. Elizabeth Spoonamore’s brother, John Newton, was married to an Amanda Baxter. It was Thomas Merrit Baxter with whom George Washington McKenney Jr. was living in 1875, boarded out after his mother’s death. Elizabeth and John Newton Spoonamore’s first cousin was William Spoonamore, whose son Isaac married Emma Jane Franklin, first cousin of Emma Brien who married Perry Partelow, nephew of Rebecca.